Exactly 4 weeks ago, my beloved father left us and went to heaven. It was Father’s Day just last weekend and I missed him so much. Reminiscing the memories of him and the 40 years we spent together especially in my early childhood, I’ve posted some old pictures on Facebook and painted a picture of his composition. I haven’t painted for ages, especially since I started line dancing. 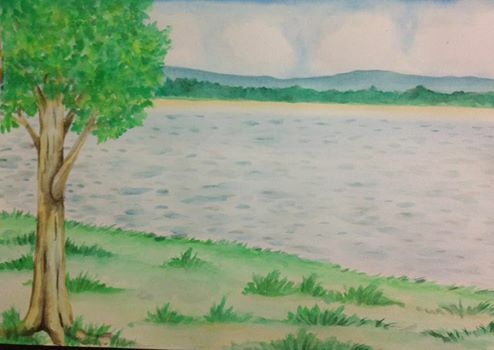 Dug out my 20+ year old water colours n started painting what was my late father’s composition when I was in primary school. Whenever the teacher asked for scenery, this would be my submission. But it looked better then because dad would always help to touch up so I could submit a presentable ‘masterpiece’. He has also gifted me the sense of music for he loved music and always listening, singing and whistling to songs, country songs being his favourite. One of the melodies I hear often while riding in his car would go, “Once in every life time… ~drum roll~ ” That melody kept playing in my head last week and so I decided to google the lyrics and found, oh, it was Cliff Richard’s The Young Ones. The steps quickly formed in my head and I got the dance recorded over the weekends with my students. The dance is a 64 count 2 wall line dance written for high beginners. There are however turning and bouncing options to suit the intermediate dancers which is as shown in the video. Hope you like it either the beginner or intermediate options. Have fun dancing it. Dedication: in loving memory of Joseph Choo Bun Siang (1942-2015). He couldn’t take his eyes off me and held me in his arms singing “Shi sang zi you ba ba hao” (Translated: In this world only fathers are good; the original song pays tribute to mothers, my dad changed the lyrics to fathers!) the whole night the night I came back from KK Hospital. I was the first born and he was a first time father. With his artistic skills, he would draw faces and animals to grab my attention as a toddler. He would also sing us hymns and songs. We were never tired nor bored with his many stories from his childhood and working-life. So many memories of family bonding time, the weekends spent picnicking and swimming at Marine Parade seaside, experimenting recipes such as making kaya (egg jam) and bakchang (glutinuous rice dumplings), the evening hikes up BM Hill, the qigong/taichi sessions, the frequent drives back to his hometown Selama for festivals and durian feasts, the plucking of mangoes from our garden, repairing household appliances as a team. A strict disciplinarian and no-nonsense man, my siblings and I were terrified of him as he’s also quick with his temper and hands. Nevertheless, we knew how much he loved us and we looked forward to him coming home from work daily, jumping with joy shouting “Ba Ba hui lai liao!” (translated: Dad is home!) when his car pulled in the driveway. With all his diligent education, training and drills for us, we are what we are today, educated and equipped with life skills, and instilled with values to be good human beings. I hope he is proud of us and smiling at us from heaven. We are proud to have him as our father, the best father we could ever have. May you rest in eternal peace and perpetual light shine upon you, papa!